Seriously?? 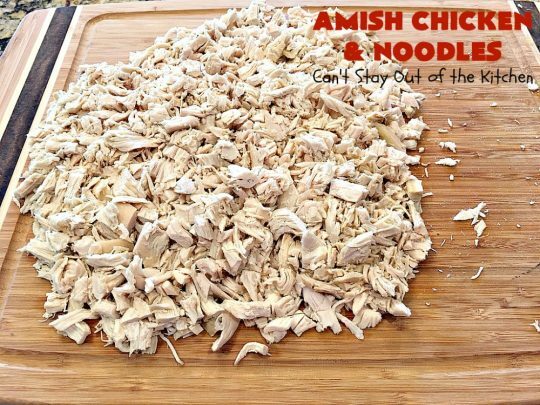 Amish Chicken and Noodles with Tony’s Creole Seasoning??? Yes, yes, a thousand times, yes. 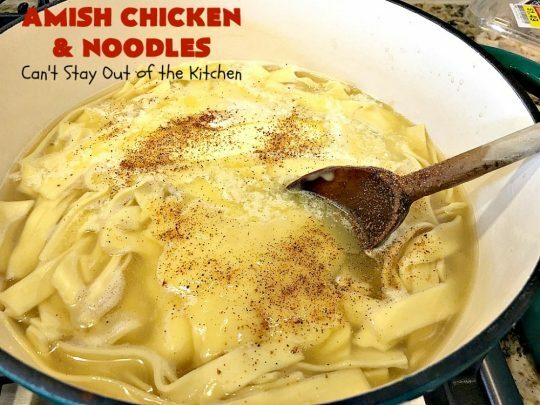 🙂 It is absolutely terrific and makes the noodles so mouthwatering you won’t believe it. You’re probably wondering why two quarts of chicken broth? 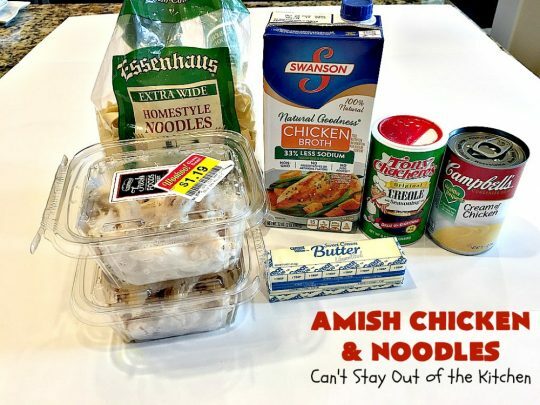 Well, Amish noodles are much thicker than regular noodles in the grocery aisle. They absorb a LOT of liquid, especially if the pot of noodles sits out for any length of time or you refrigerate them. They also taste a whole lot better. I got this recipe from a gal who lives in our neighborhood. We handed out gift bags of cookies for Christmas last year. John helped her recover some pictures she’d lost on her computer too. So they invited us over for dinner one Saturday night a month or so ago. Wow, talk about being treated like kings and queens! Linda made nine, yes that’s right, nine different things for us to eat. She served this amazing Amish Chicken and Noodles, Fried Green Beans, Baked Pineapple, Favorite Fruit Salad, yeast rolls, Deviled eggs, Brown Sugar-Glazed Carrots, a luscious Oreo Cookie Dessert and Boudin Balls. They picked up the Boudin Balls on their last trip to Louisiana. Oh my gosh, everything was so amazing. I wanted recipes! We had several servings of just about everything. The meal was heavenly. Quite frankly, I’m usually the one who cooks for everyone else. It really felt nice to be spoiled by that fantastic dinner. She went to so much work to show us her appreciation. Plus, we really enjoyed just getting to know them a little bit. Linda showed me her self-published cookbook that she had put together for family and friends several years ago. She made it specifically for her daughters-in-law who wanted to make their husband’s favorite family recipes. I started looking through it and drooled over the recipes. Finally, I got the courage to ask her to allow me to borrow the cookbook so I could copy some of the recipes and make them. (She sold all of the original cookbooks years ago). I felt like I had hit the goldmine with Linda’s cookbook. I thought I’d seen almost all the old-fashioned recipes circa 1940s, 50s, 60s & 70s over the years. But out of about 500 recipes, I think there were only 10 or 15 that I’d seen before. I can’t wait to start making some of Linda’s recipes! 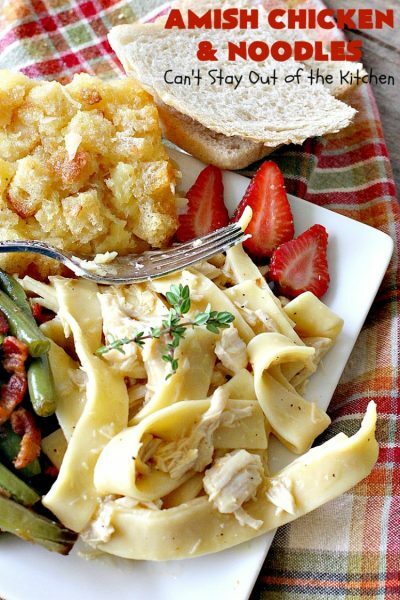 Linda’s from Louisiana so her recipes have that Cajun and Creole flair that’s just awesome. She’s a Louisiana gal who met her Idaho husband in Pennsylvania years ago at a church retreat. She was asked to be the pianist and she ended up marrying the preacher. He us now a retired Nazarene preacher that does a lot of interim pastorates. They just took their camper and moved to Louisiana to do a pastorate there for a few months. 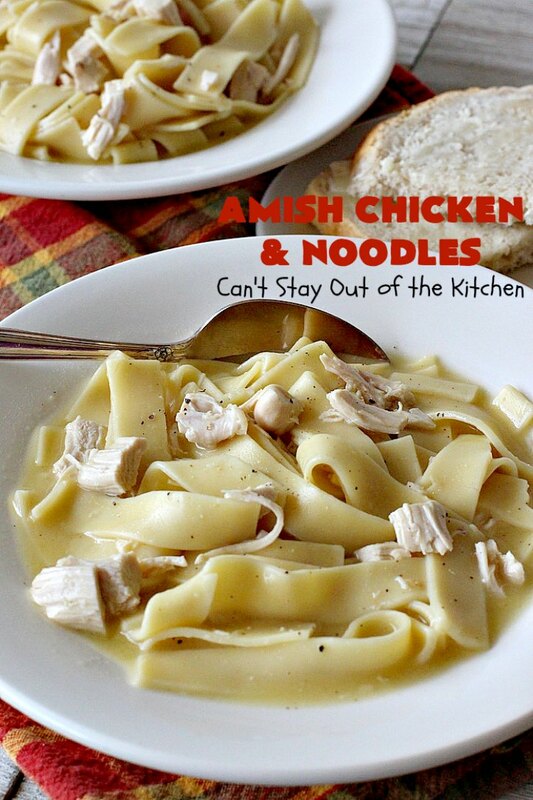 Anyway, this Amish Chicken and Noodles has been a big hit whenever I’ve made it. I made a double batch for our Friday night care group and they raved over it. I sent the leftovers to a family who had a baby. I also made this for another member at our church who just had a baby, and our next door neighbor who just had neck surgery. As I stated earlier, this recipe is SO easy and quick, it’s perfect for quick meals to take to others or for your own family meals. We loved the Creole flair to Amish Chicken and Noodles. If you need a quick comfort food recipe, this recipe can’t be beat! 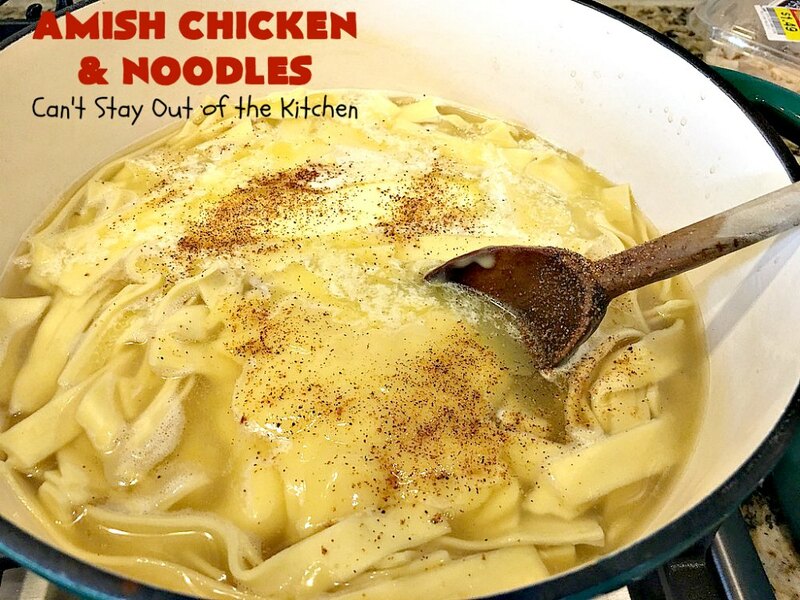 Amish Chicken and Noodles is so incredibly quick and easy to make. I love 30-minute meals. This one’s absolutely terrific. The thick Amish noodles absorb most of the liquid even though I used two quarts. 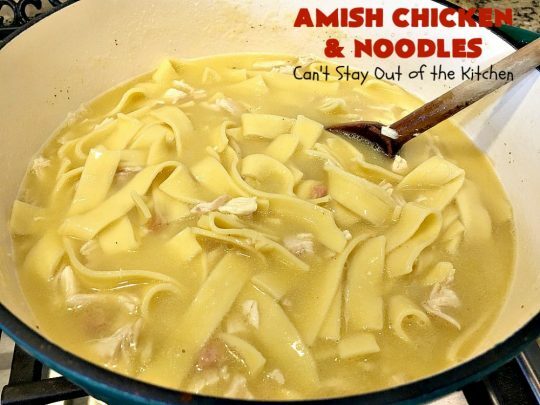 Amish Chicken and Noodles is amazing comfort food. 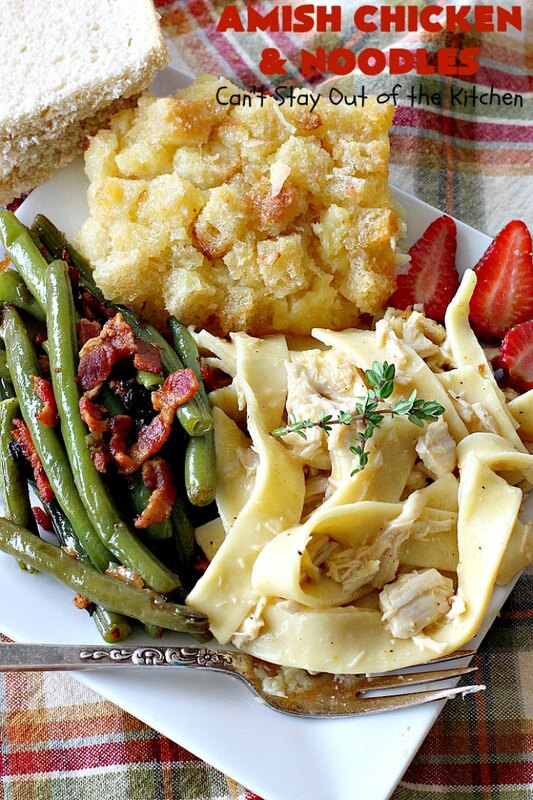 I served Amish Chicken and Noodles with Fried Green Beans, Baked Pineapple and Dairy Free White Bread. Everything was so scrumptious. I used these ingredients along with a little salt and pepper. I used two quarts of the chicken broth because the noodles absorbed so much liquid. Pour chicken broth into a Dutch oven over medium high heat. Cover with lid and bring to a boil. Add noodles and cook until done. The package said between 10-20 minutes. I though the noodles were cooked after 9 minutes. Add butter, Tony’s Creole Seasoning and a can of cream of chicken soup. Stir to combine. Chop up chicken rather fine. Add chicken to broth with noodles and other ingredients. Stir to combine. Heat through about 3-5 minutes. You will notice a big difference in this picture and after the noodles have set out about 10-15 minutes. They absorb most of the liquid. See the difference? This is only a few minutes later. If you need to reheat the noodles later, you can add additional water if necessary. Amish Chicken and Noodles is one of my go-to recipes to take to friends in need of a meal. I served Amish Chicken and Noodles with Fried Green Beans, Baked Pineapple and a loaf of Dairy Free White Bread. It was an amazing stick-to-the-ribs meal. This is really a wonderful comfort food meal with Fried Green Beans. So yummy. 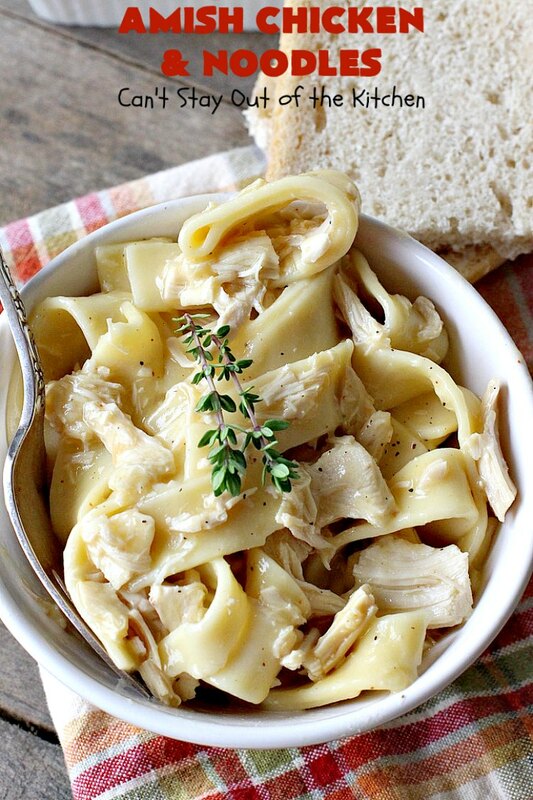 Amish Chicken and Noodles heat up well for leftovers. 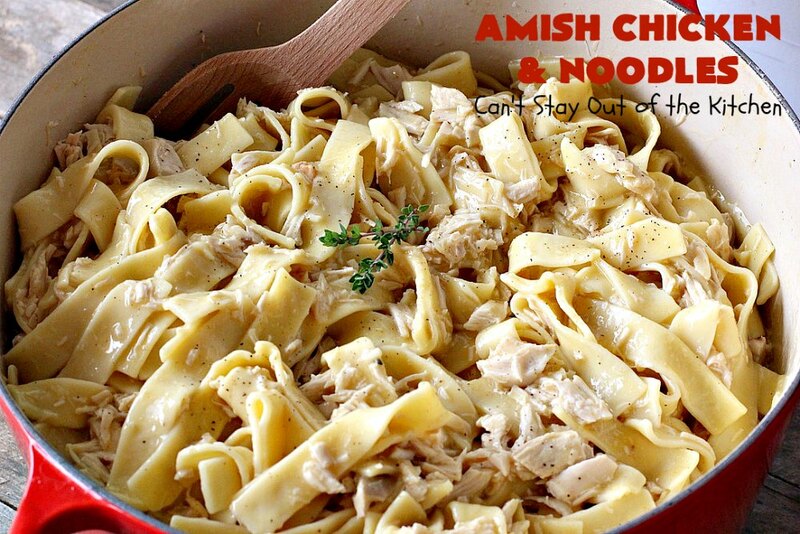 Amish Chicken and Noodles are absolutely amazing. This comfort food recipe uses only 6 ingredients and takes about 30 minutes to make. 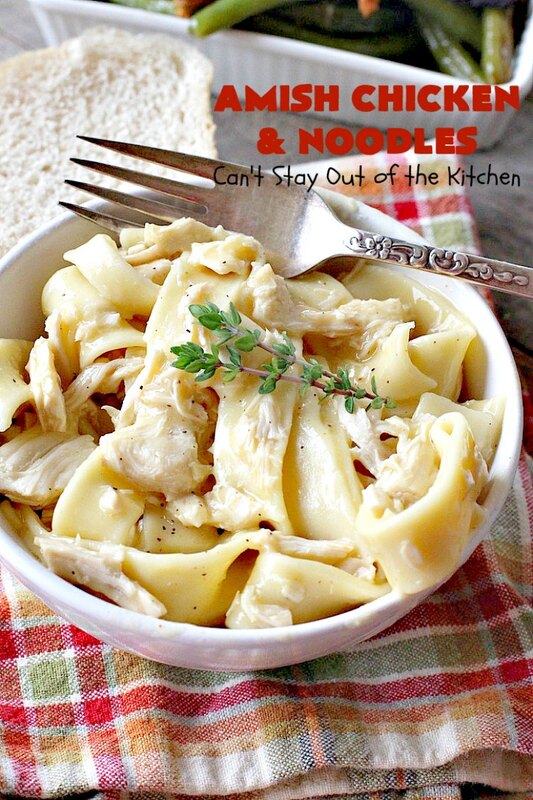 It's perfect for weeknight dinners when you're trying to get dinner ready in a jiffy. In a large stockpot or Dutch oven, bring chicken broth to a boil over medium heat. Then add butter, chicken soup, seasoning and cooked chicken. NOTE: The noodles will absorb the chicken broth the longer it sits out. To reheat, you may have to add additional water or chicken broth. NOTE: The directions for cooking the noodles included a time span from between 10-20 minutes. I found the noodles were cooked through at 9 minutes. NOTE: The amount of chicken broth required will be between one and two quarts. I found when using Essenhaus Amish Noodles I needed two quarts. When I used Mrs. Miller's Amish Noodles I only required one quart. Certain types of noodles absorb more liquid than others, so be prepared to have the chicken broth on hand just in case. 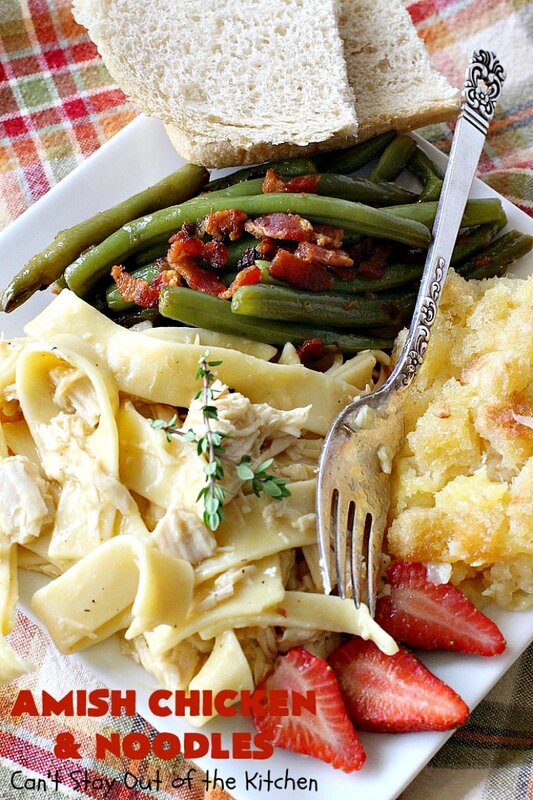 If you need a quick and easy weeknight meal, this is it! If you enjoy southern food, serving Amish Chicken and Noodles with Fried Green Beans, Baked Pineapple and a loaf of homemade bread will do the trick. 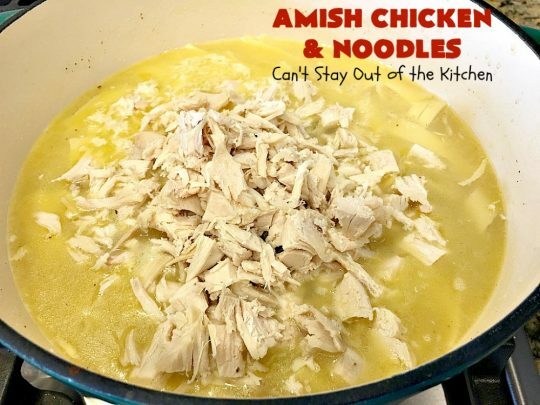 Every bite of Amish Chicken and Noodles is so mouthwatering. Just found this recipe on Pinterest. It looks delicious and I will definitely be making it soon. I am looking forward to reading – and making- more of your recipes soon! Thank you! Hi, Melanie. 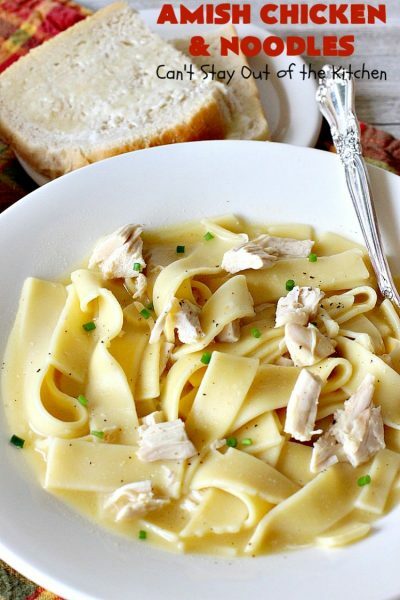 It is such a simple and delicious recipe. Hope you enjoy it. Made this for dinner tonight, I enjoyed it. Simple, fast and tasty too. The Oreo Ice Cream Dessert that Linda made sounds tasty, are you going to share that recipe too? Yes, Dawn, I will share that recipe as soon as I make it. Right now I’m in the middle of baking 20-30 cherry desserts so it may be sometime this fall. 🙂 Sorry. I made this for dinner tonight & my husband & I both loved it. Thank you for such an easy & delicious recipe. I appreciate that it is made in one pot & really was ready to eat in 30 minutes. I use organic free range chicken broth & do not feel the need to stand over a hot stove all day making chicken broth from scratch. Thank you again for the great recipe, I will be making it often. Hi, Mary. So glad you enjoyed this lovely recipe. 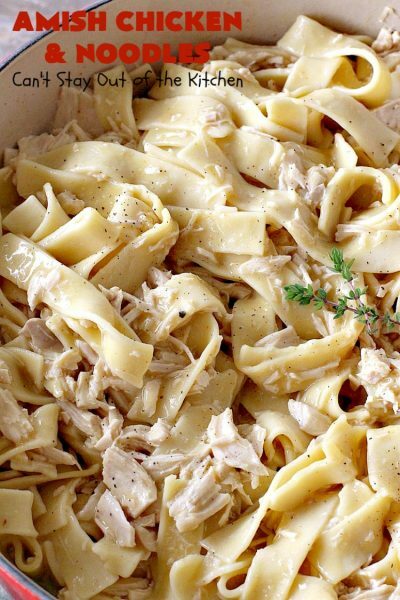 It really is so delicious and one of our favorite recipes, too. Hi Teresa, Just wanted to thank you for all the hard work you do to share your wonderful recipes and tips. Every one of your recipes that I have tried turned out great, and have become many of our “go to” recipes. It always boggles my mind that people who write in and want to nit pick. We can’t all live on farms like the Amish, but we can, thanks to you, get a taste of the old world flavors of the Amish. So what if we can’t always make our own broth, etc. Hang in there. YOU are much appreciated in my family! Rita, how very kind of you to say this. I’m so glad that you have tried many of my recipes and that they’ve turned out well for you. This particular recipe is so easy and delicious that I’ve made it several times just to give it away for meals for friends. Without fail, everyone has loved it–even with the crazy twist of adding Tony’s Creole Seasoning to it! Thanks again for stopping by and letting me know how much you enjoy my blog. Have a great week. Where can you buy Amash wide noodles? I live in Texas and I have never seen them..
Hi, Ann. I found the Essenhaus brand at the Wal-Mart in Cedar Hill, TX–a suburb of Dallas. Every time I go there, I end up clearing out their whole stock and then stash them in the freezer to keep them fresher longer. I think you can also go to the Essenhaus website and you can order them online. Some natural food stores also carry these. I never buy them, I make them. I have not yet moved past the feeling that an Amish woman, even “an escaped one” shouldn’t purchase food item or produce. If I was making them at seven years of age, I can keep on making ’em at 70 years of age. Besides it has kept me tied to my heritage. When I make them I can still see my great-grandma rolling and cutting all the while hum a favorite faith tune. I suggest ordering on-line or from Wal-Mart. Not many Amish would use condensed soup, store noodles, canned/cartons of broth, supermarket pre-cooked chicken . As I stated I think the dish is probably delicious , but seems misleading to publish it as an Amish recipe. Most Amish raise and dress their own chickens. Hi, Nana. I wish I had time to raise and dress my own chickens, but that’s probably not going to happen in my lifetime. 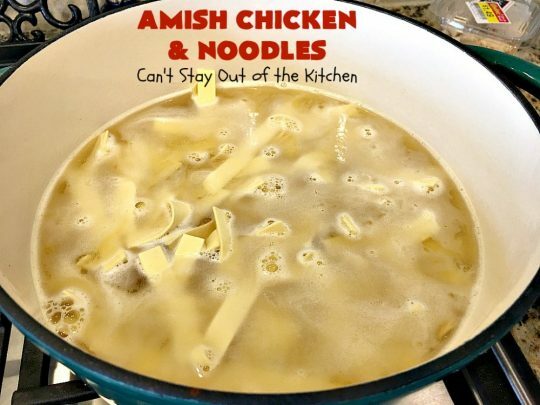 🙂 Actually, I have several Amish cookbooks that use canned soups, broths and other pre-made ingredients in their recipes. While I always prefer to make everything from scratch, it just isn’t feasible for a lot of families these days. This recipe is meant to be an alternative for those folks. Oh, and by the way, the noodles I use are actually made from an Amish restaurant in Indiana. They are soooo much better than even my Mom’s homemade egg noodles recipe. Probably because they use farm-fresh eggs and their own stone-ground grain. Anyway, thanks for stopping by and letting me know how you feel. I just adore all those little chicks running about the barnyard in their adorable little bonnets! LOL. I agree that it is hard to accept an Amish recipe as actually being Amish with commercial food products used in it. Remember though, there are old-order Amish that keep traditions of long ago and everything else until Amish doesn’t seem very Amish anymore. Contemporary Amish communities do avail themselves of more convinenant products. Hi, Deloris. I’ve replied to Nana a couple of times as well as others, so perhaps you can check out those responses too. Thanks for stopping by my blog. 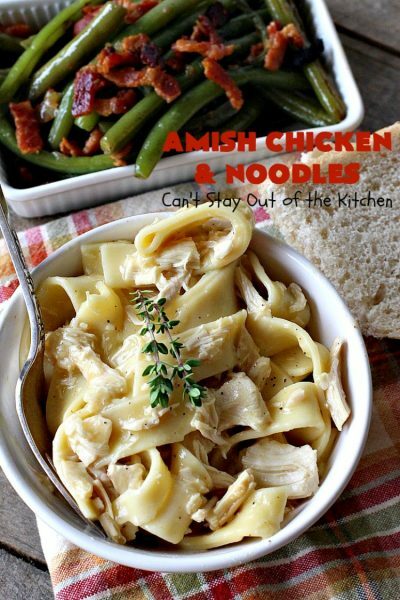 It is not claiming to be the one-and-only, absolutely 100% authentic recipe– simply a variation of an Amish dish. I, too, am quite familiar with Amish cooking and, other than the unique seasoning, don’t find it to vary a great deal from those recipes with which I am familiar. Hi, Mary, Thanks so much for stopping by and sharing your thoughts on my blog. I really appreciate your feedback. 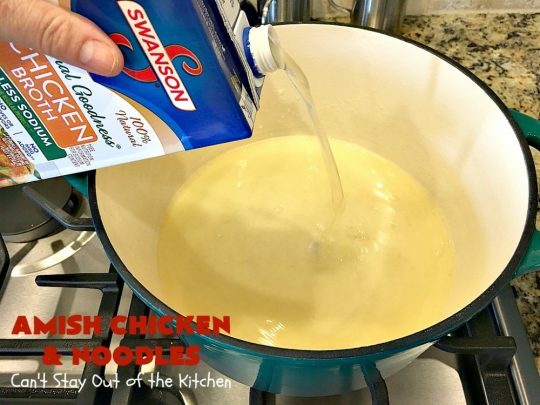 The Tony’s Creole seasoning provides a wonderful cajun twist to an old fashioned Amish type recipe even if it’s not a seasoning generally used by the Amish. Anyway we found this recipe so easy and delicious. Hope you give it a try. P.S. 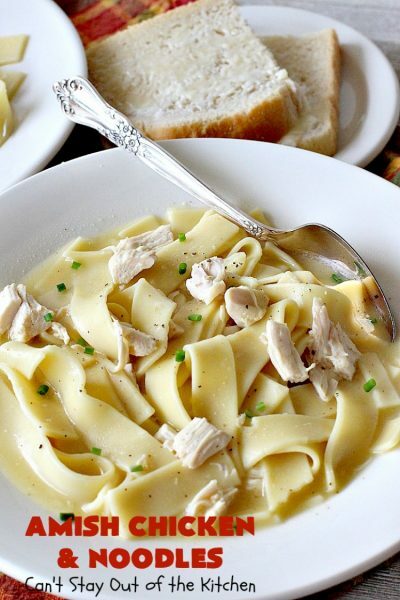 I have several truly homemade chicken and dumpling type recipes on my blog, but most people don’t have time to roll out dough anymore, so this provides a better option. Anyway, thanks again for stopping in. While this dish may well be delicious and/or easy it is nothing like authentic Amish would fix. I live in a heavily Amish populated area and I think they would be aghast at this version. Hi, Nana. I agree that most of them would probably make their own homemade chicken soup version. – I’m sure none of them would use Linda’s delicious and creative spin with the Tony’s Creole Seasoning either, but it’s so delicious. But for those who want the taste but work full time and don’t have time to spend several hours in the kitchen, this is a terrific option. Thanks for stopping by.